At the age of four, Lena Jones was found lying unconscious by the side of an Arizona Highway, a bullet robbing her of any memories. Now a private detective and scarred survivor of a dozen foster homes, Lena has vowed to find the truth about her childhood. But Lena's quest is interrupted when her friend, art dealer Clarice Kobe, is beaten to death in her Western Heart Art Gallery on Scottsdale's Main Street. Lena and her Pima Indian partner Jimmy Sisiwan first suspect Clarice's abusive husband, but their investigation soon reveals that domestic violence was far from the only problem in the dead woman's life. For all her money and beauty, Clarice had far more enemies than friends. Among them are a fiery Apache artist whose graphic work she once banned from her gallery and the daughter of an elderly Hispanic woman whose death was directly attributable to the gallery owner's greed. And Clarice's land developer parents are oddly untroubled by their daughter's murder. 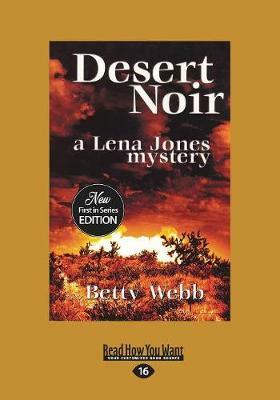 Lena's search for the killer brings violence back into her own life but does it bring her closer to solving her own personal mystery With a foreword by Betty Webb.